Young Imaginations received a generous donation of $10,000 from John M. & Bernice Parrott Foundation Inc. in support of our new and exciting Indigenous program at the Quinte West Public Library. The program will explore with children from the Quinte West Community and beyond the Rotinonhsyón:ni culture through the arts with Indigenous and non-Indigenous artists and teachers. Young Imaginations is pleased to announce that we have received funding in the amount of $5000.00 for the PEC’s People Engaged in Community from The County Community Foundation for a new project, The Canadian Story and Song Explorer project. Prince Edward County-based musician Sam Hirst will collaborate with elementary school age children and other artists in the community to form a choir, with storytelling and songs as the basis for learning about Canada’s rich past. Stories and songs will use music to interpret and expand on Young Imaginations' existing programs that explore the history of the Loyalists, Acadians, War of 1812, Louis Riel, Black Canadians, Inuit, and Haudenosaunee (People of the Longhouse). A choir presents a unique opportunity to learn about Canada’s diversity of cultures and their history, through storytelling, drama and choral singing. Participants will present The Canadian Story and Song Explorer project for the public in Prince Edward County in December 2017. The Royals visit Prince Edward County! 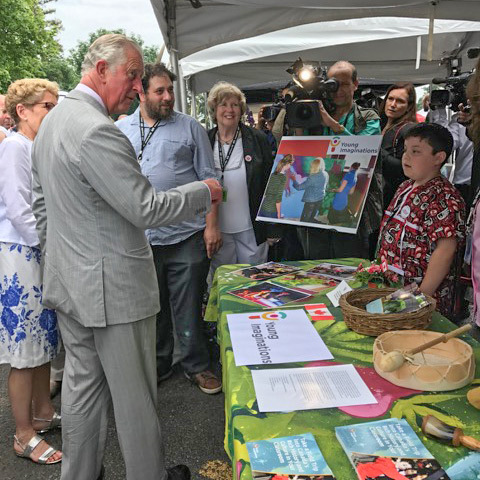 In honour of Their Royal Highnesses, The Prince of Wales and The Duchess of Cornwall’s visit to Ontario to celebrate Canada’s 150th Anniversary of Confederation, The Honourable Kathleen Wynne, Premier of Ontario invited Young Imaginations to take part in a special edition of the Wellington Farmers’ Market on Friday, June 30, 2017. What a great day! New Project Receives PEC Funding! Young Imaginations is pleased to announce that we have received funding in the amount of $5000 for the PEC (People Engaged in Communty) Fund from the County Community Foundation for a new project, the Canadian Story and Song Explorer project. Prince Edward County-based musician Sam Hirst will collaborate with children of elementary school age and other artists in the community to form a choir, with storytelling and songs as the basis for learning about Canada’s rich past. Stories and songs are based upon Young Imaginations’ existing programs exploring the Loyalist, Acadian, War of 1912, Louis Riel and the Red River Rebellion, Black Canadian, Inuit, and Haudenosaunee (Mohawk) stories and songs. A choir presents a unique opportunity to learn about Canada’s diversity of cultures and their history, through storytelling, drama and choral singing. Participants will present a program of Canada’s historical stories and songs for the public in December, 2017. On October 22 at the Aboriginal Artfest at the Mohawk Community Centre in Tyendinaga, local MPP Todd Smith, Ontario Trillium Foundation volunteer, John Blake and Mayor Robert Quaiff of Prince Edward County formally congratulated Young Imaginations on the work it’s been doing since receiving a $100,000 Grow Grant from the Foundation earlier this year. Funds from the two-year-long grant are being used to help with the costs of expanding its successful Canada’s Cultural Roots/Kanyen’keha:ka O:kara’shon’a (CCR-KO) educational program for youth in Tyendinaga Mohawk Territory. Todd Smith, MPP for Prince Edward-Hastings, said, “Congratulations to the Young Imaginations group on receiving the Ontario Trillium Foundation grant to expand their program to more students across the area. We have seen what a terrific impact this program has had on children in our community, by helping them express their creativity, while teaching them about Canada’s history, as well as cultural diversity.” Young Imaginations is a well-established arts organization that brings Canadian history and culture to life for young people through arts education programs. Funds from the grant are helping with the costs of supporting a Project Coordinator and other personnel costs, as well as helping with film and presentation supplies, creating activity resource kits, and helping with website maintenance. Young Imaginations’ Executive and Artistic Director Evva Massey accepting an Ontario Trillium Foundation grant to help fund the organization’s project, Canada’s Cultural Roots – Kanyen’keha:ka O:kara’shon’a. The program will involve the Ohahase Education Centre in the Tyendinaga Mohawk Territory and the Quinte West Youth Centre. With Evva are Prince Edward-Hastings MPP Todd Smith and John Blake from the Ontario Trillium Foundation. “This project offers our youth an opportunity to build and expand on arts skills in a variety of media, as well as offering an avenue to teach other youth about who we are as Mohawk people, in a very interactive way,” said Chief R. Donald Maracle. With the support of the Ontario Trillium Foundation, Young Imaginations, together with Ohahase Education Centre and Tsi Tyonnheht Onkwawenna in Tyendinaga Mohawk Territory and Quinte West Youth Centre, in Trenton, will expand this collaborative and unique project. Over the next two years, youth from Tyendinaga will be trained by art educators in various arts skills, including drama, dance, drumming, film, visual art and script writing. Following the training period, youth will take on leadership roles to facilitate, create and develop a presentation from stories of the Rotinonhsyón:ni culture with primary and junior level students from Tyendinaga Mohawk Territory. The students will bring these stories, along with youth-led arts sessions, to elementary schools in Hastings, Prince Edward, Frontenac, Leeds and Grenville Counties and Tyendinaga Mohawk Territory. “This program will open up opportunities for further education and youth entrepreneurship that will foster greater respect and understanding for the Rotinonhsyón:ni people. This aligns with Young Imaginations’ mission and mandate,” said Evva Massey, Executive and Artistic Director, Young Imaginations. This newly expanded CCR-KO program is an opportunity to build, nurture and mentor strong leadership roles within the youth and empower them and children to strive for success while fostering an understanding and respect for Canada’s Onkwehonwe people. An agency of the Government of Ontario, the Ontario Trillium Foundation is one of Canada’s largest granting foundations. With a budget of over $136 million, it awards grants to some 1,000 projects every year, to build healthy and vibrant Ontario communities. For more information about the Ontario Trillium Foundation, visit otf.ca. Local students will learn about and share cultural history here, thanks to a provincial grant assisting the expansion of a Young Imaginations project. The not-for-profit organization based in Prince Edward County is designed to bring arts education to preschool and elementary school age children, with an emphasis and focus on drama and supported through dance, visual arts and music. On Saturday, executive and artistic director Evva Massey accepted a $100,000 Ontario Trillium Foundation grant to help fund the organization's project called Canada’s Cultural Roots – Kanyen’keha:ka O:kara’shon’a program. The presentation took place at the Mohawk Community Centre during Aboriginal Artfest 2016. The program involved the Ohahase Education Centre in the Tyendinaga Mohawk Territory and the Quinte West Youth Centre. On Saturday Massey said that youth will be trained by art educators in various skills including drama, dance, drumming, film, visual arts and script writing. Following the training period, youth will take on leadership roles to facilitate, create and develop a presentation from stories of the Rotinonhsyón:ni culture with primary and junior level students from Tyendinaga Mohawk Territory. The students will bring these stories along with youth-led arts sessions to elementary schools in Hastings, Prince Edward, Frontenac, Leeds and Grenville Counties and Tyendinaga Mohawk Territory. “This newly expanded program is an opportunity to build, nurture and mentor strong leadership roles within the youth and empower them and children to strive for success while fostering an understanding and respect for Canada’s Onkwehonwe people,” she said. R. Donald Maracle, Chief of the Bay of Quinte Mohawks said the project will help facilitate a greater understanding of the history of the First Nations. “As most of you know our ancestors had lived here for thousands of years before the Europeans came to North America and right now it is period of reconciliation and healing of the past, where our people haven't fared so well in that relationship,” he said. John Blake, a volunteer with the Ontario Trillium Foundation, said getting the OTF funding is a competitive process. Ultimately, only about one third of applicants are actually funded. Also present at the event were Prince Edward County Mayor Robert Quaiff and Prince Edward-Hastings MPP Todd Smith. In addition to the programs in our current repertoire, Young Imaginations will custom design drama focused arts sessions to support the Social Studies and History curriculum for the Primary, Junior and Intermediate levels and will also provide additional program enhancement workshops to core drama programs in Visual Arts, Music, Dance, Interactive Musical Performance. These individual workshop options, featuring a variety of Canadian artists, can be booked through Young Imaginations. Looking at a topic in depth, through drama, visual art, photographs, literature, created deep meaning for my students. It was so much more than just covering the curriculum – this aspect of Canadian history will resonate in all of us for the rest of our lives. A wrap-around, arts based program designed specifically for teen parents and older youth parents to have fun while engaging and learning with their babies/toddlers. A warm meal will be provided at each session. Funded by the Ontario Trillium Foundation, this program is being offered as a collaborative initiative between Young Imaginations and the Quinte West Youth Centre and additionally supported by Ontario Early Years Centre – YMCA Northumberland. An Early years specialist, art activity specialist, child and youth worker and parenting supports will work together to create a fun, safe environment to connect and explore through creativity and expression. Art activities that enhance, strengthen and encourage close attachment between young parent and child in a safe, nurturing environment. Warm dinner included! © 2017 Young Imaginations - A Creative Arts Centre. All Rights Reserved.